A startup is a venture that is initiated by its founders around an idea or a problem with a potential for significant business opportunity and impact. Often the actual development starts even before that with a search of an idea or a meaningful problem worth solving and building a committed founding team aligned with shared vision to make that vision into reality. Aim of the initial founder(s) is to establish a committed co-founder team with necessary skills and abilities to be able to validate the initial problem/solution fit and product/market fit, before scaling it to significant company and self sustained business. So in addition to innovation process itself, from idea to value generating product and business model, startups also need to have a strong and committed founding team and develop both of these together into a real growing business and organization that captures the value being created as a great company. A great company is a self sustaining entity that is no longer dependent on any single individual or other organization, where all necessary knowledge, values, strategies, IPR etc. are permanently embedded to its existence in a way that it can continue to operate, improve and build value for customers, shareholders and other key stakeholders, while remaining financially stable by the value of solutions and products it creates. 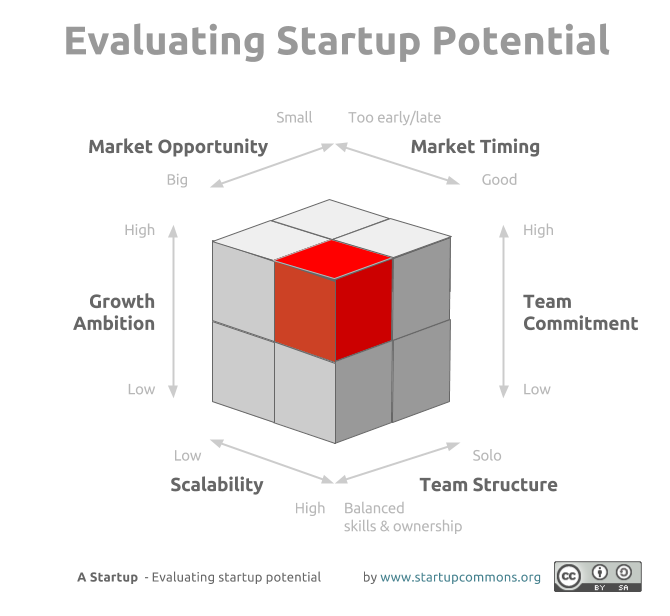 Evaluating Startup Potential by Startup Commons is licensed under a Creative Commons Attribution-ShareAlike 4.0 International License. Few things are as important as common understanding and definitions. Without knowing exactly what specific terms mean, and how they apply to given situations, little discourse startup or ecosystems development can take place. In developing startups and startup ecosystems, there are still many terms that are misunderstood or misused. As the term startup is not an officially defined term anywhere in the world, there are several things to take into account when choosing a definition for a specific use case in an organization, city ecosystem etc., to keep it logically aligned in other commonly appearing definitions and by comparing it with use of other often associated terms, for reasonable and logical separation also for those trying to understand the use and meaning of the term when looking from outside in. ​Entrepreneur is an individual, startup is an entrepreneurial team. However often times media likes to highlight individual entrepreneurs over teams and also many team members may prefer not to be so visible, even the business needs faces and can benefit from the media visibility. It also starts to be commonly understood that startup is not a smaller version of a big company, but an "organization formed to search for a repeatable and scalable business model” so being in process of creation and growth, where growth is not only measured simply by traditional business terms like revenue or profit until possible or feasible, but also by market share, number of active users etc. even with a free product or service. ​For these reasons startups can also not be categorized simply by the size of the company ie. SME, Mid Cap or Large corporation, by their resources ie. number of people, profits, assets etc., or the age of the company. Startups are commonly considered to be anything from few co-founding people and an idea, in some cases even without having registered a company yet, - to several years old company with tens or even hundreds of people, regardless of making or not any profits or revenue yet for several years, while focusing on building the value and scaling the opportunity of the company in other ways (market position, assets, reach, scale, recognition, brand, etc.). That said, sometimes startups also prefer not to call themselves as startups when it suits their needs, like in some cases when they want to appear more stable or mature, ie. in the eyes of significant customer. To mix things even more, there is another related and relatively new term that have started to emerge in recent years that is "scaleup". While this can be logically described to be a company at scaling phase, there is an aspect to consider, that it's not limited for a startup company that have reached the scaling phase, but can be also used for an older company that have found a new scaling mode as a result of new product/service and/or new owners with new growth ambitions and/or business model. At the same time, due the fast development of technology, internet, software, open source concepts, API’s, app stores and other platforms, crowdfunding, ICO, etc. startups are no longer as dependent on requiring risk capital in form of venture capital, business angel funding, equity crowdfunding etc. to make a “funding round” or even to make an “exit”, as something that is required for building a successful startup. So while a successful funding round can be one type of positive indicator along with other validation signals, it should not be mixed as requirement or measure of actual success, but just as single milestone. Choosing the external investor route is optional strategy choice among others. That said, it makes sense to build the business also to be investable, to have that option available in case that strategy would turn out to be the right one to choose at some point. As anything an investor would look for in a startup, is also good for business in general as well. ​All things considered the topic about "investors" and "search for investments" are disportionately over represented in startup ecosystem support targets compared to all other things that are key factors for success of a startup. Startups are “optimal” vehicles to validate and bring new innovations to the markets. Especially more disruptive innovations. Startups encapsulate all but only relevant things for what's needed to build new innovations with minimum “wasted resources” combined with maximum drive & motivation. Regardless of innovation and entrepreneur being older terminology and yet still also being often mixed or misunderstood with terms like inventions and small business owners, those are still already much established terms than "a startup" - a term that originated from US. in late 70’s and became popular in the late 1990’s as part of the technology and internet hype and bubble that eventually bursted around year 2000. Startup (ie. startup company sometimes also known as upstart) term emerged to describe and identify a new or early stage company with higher than usual growth potential due technology it was developing. This meant that for that growth potential to be possible, it was relaying to new technology and since 90’s also to internet as the high growth enabling factor. These startups were known as internet startups or more broadly technology startups, and as such the term “startup” is still mainly referred as “technology startup”. The term was needed and as such created by venture capital industry, that used the term to separate these specific type of new growth potential companies from traditional entrepreneurship, generally new companies and small businesses, where the main factor for this separation was the “scalable fast growth potential”, at the time mainly associated or enabled by technology and in late 90's by spread of internet. Due where the term have originated from, the term is also the reason why the term is still so strongly tied with investors and risk funding and also tied with technology mindset. Once there was this new definition for a "category of new businesses" created, like with any such definition, many other aspects started to be considered and validated over time by VC’s about “what makes a good startup”, where one crucial factors was the founding team and the structure of the founding team, specifically from the attitude and skills perspective. This meant that in addition to business idea and growth potential with technology as an enabler, a key separator for identifying potential investable startups, a founding team setup with complementary skills have become to be considered as one of the (if not "the one") key investability factors. Over few decades, many of these startup requirements by startup investors have been further “iterating” via validated success and failures of various types of startups mainly captured as personal experienced by investors and serial entrepreneurs. As well as further iterated by development, growth and maturity of the “startup” as a model and ecosystems around it, by other actors like business angels, incubators and accelerators, as well as new startup oriented tools and methodologies, such as business model canvas and lean startup. These factors combined growing interest towards startups and "startup model", together with wast knowledge sharing and social media tools and channels, have made the collective learning and iterative refining process of “what makes a good or potential startups” and ongoing and further accelerating process. While this defining progress is globally spreading, ongoing and there are quite many views and opinions about what is “a startup”, there are however already enough collective and mutual “consensus” to define what a Startup is and what it is not to make the term useful. Compared to much older related definitions of “innovation” and “entrepreneur”, startup is starting to be equally well understood for the meaning of the term as the other two. ​Also, while technology still plays a major role in startups, as digital technology itself have become more affordable, available and commonplace in general, - technology itself is not the key factor anymore in most cases, but what is done with things that technology have already enabled. As such, it's logical that startups are being referred more commonly just "startups", to help make separation to non growth oriented new SME companies, as high impact startups or innovative startups, especially in the areas or among people, where startup as a term is still less familiar or relatively new in context. Therefore a better way to identify and evaluate the potential of a startup, is from the key parts they are composed ie; team, innovativeness and growth ambition and from their current development phases on their journey, instead of type, size, age, or funding rounds, for best provide the type of support they need in their current stages and going forward. Regardless of the terminology, the more there are entrepreneurship and innovation, the more there are startups. And the more there are startups, the more there are great companies, scaleups and positive development in the economy and society at large. And that's why developing a healthy startup ecosystem is a holistic exercise.